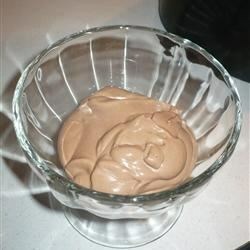 "This is without any doubt the best ever chocolate mousse recipe I have ever tried. You have to try it to believe it! This recipe contains raw eggs. We recommend that pregnant women, young children, the elderly and the infirm do not consume raw eggs." In a microwave-safe bowl, microwave chocolate until melted. Stir occasionally until chocolate is smooth. Stir marshmallows into hot chocolate until melted. Set aside. Whip egg whites until stiff peaks form. Whip cream until soft peaks form. Stir egg yolks into slightly cooled chocolate mixture. Fold in egg whites and whipped cream. Stir in peppermint extract. Chill 2 to 3 hours before serving. This recipe was absolutely aweful. I amde 4 mousse' for a 'mousse comparison' night and everyone really disliked it. What a shame. THIS RECIPIE IS DELICIOUS.TRY FREEZING AND EATING LIKE ICE CREAM! !